In a move that surprises no one, EA has announced that an anime based on Dragon Age: Origins is in the works. It's no secret that EA likes to produce tie-in material for its bigger videogames. Novels, comic books, and movies have all been the popular forms of adaptation, though the latter has yet to really impress anyone. But the publisher apparently believes in the magic of movies, because it's just announced that 2011 will see the release of an "anime feature film" based on the critically-loved Dragon Age: Origins. The project is being worked on by FUNimation, a company that produces, markets, and distributes anime in the United States. However, this is the first project that FUNimation's Original Entertainment team is going to be working on, so it's hard to say just what kind of quality we can expect from the film, though EA and Bioware want us to believe that it will be awesome. 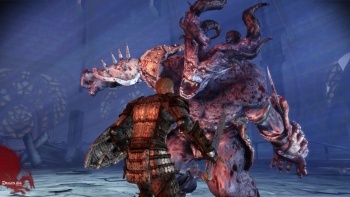 "Anime is a great medium for us to continue the robust Dragon Age story," said Mark Darrah - Executive Producer for the Dragon Age franchise when the announcement was made. "Partnering with FUNimation ensures that we are delivering the exceptional quality and entertainment value that our Dragon Age fans expect." So far, EA's animated films have been pretty weak. Dead Space: Downfall wasn't scary at all, largely due to lame animation quality and style choices, while Dante's Inferno was just a lackluster summary of the game's story (though the involvement of different animation directors for different parts of the story was, admittedly, interesting). Last year at E3, I spoke to the producer of Dead Space: Extraction, and he admitted that nobody at EA was really happy with Downfall. These previous films were made with Film Roman and Starz/Anchor Bay, which is probably why EA is partnering with someone new for this venture. Here's hoping the third time is the charm.